Can You Place Your Phone Number In Your Google AdWords Display URL? Home > Google News > Google AdWords > Phone Numbers In Google AdWords Display URLs? 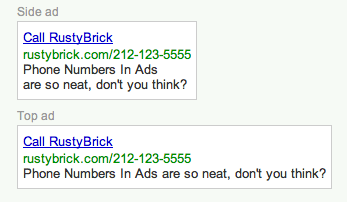 Phone Numbers In Google AdWords Display URLs? A WebmasterWorld thread has search advertisers discussing the ability and feasibility of using the display URL to show your phone number. Supposedly, Google is going to crack down on ads using phone numbers in the headline or text. So advertisers are asking if they can (1) get away with showing the phone number in the display URL and if so (2) would it work to get phone calls. The thread is asking if anyone tried this before and so far, very few have. One said he tried it before Google had phone extensions and it worked. He said it is "a great way to attact new biz...and just makes it easier for people to find you." Have you tried it? Do you think Google will allow it?